Last edited by ggippo on Sun Apr 18, 2010 11:01 pm, edited 1 time in total. Major Wright, in the third, looks like more of a possiblity now for Miami IMO. If we look to add any depth/competition at the WR position, I would love to see Parcells dip into the talent pool again at Montana and take Marc Mariani. 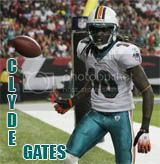 He is a talented receiver and a very nice return specialist. I gotta say, he reminds me a little bit of Wes Welker. Know anything about Shann Schillinger the Free Safety from Montana? Morgan Burnett as an early 4th round pick is a surprise. I will be very surprised if he get's out of the 2nd round. ggippo, I have as much respect for the SEC as anybody and they lead in numbers of guys in the NFL, but the ACC has been 2nd to the SEC in this category the last 5 years. Morgan Burnett is a very good football player and I am surprised to read that comment from you. We will disagree on this one George. I like Burnett more than Wright. Wow!!! This is a great post!! I have some reading material for the draft next week. Has the injury to Micah Johnson really leave him undrafted? That kid is a beast and he just did well at his college pro day workout. I would have to imagine he will get drafted somewhere. In fact, I wouldnt be surprised if Miami went after him as a bargain pick for depth and special teams as when healthy, this kid is a beast and always around the football. I like Micah but his slow 40 and less than stellar showing at the senior bowl dropped him I think. But I would have to disagree with the undrafted prediction. I still don't see him getting past round 5. Did he practice. I seem to remember him having a bad showing somewhere. But then again he would have been injured. I've seen the guy play and he was always a beast on the field. George, Micah hurt his knee in the Music City Bowl against Clemson and did not participate in the Senior Bowl. He went to the combine and ran a 4.99 40, which hurt his stock. He ran a 4.84 at Kentucky Pro Day, but that still is not blazing. Good football players drop all the time.